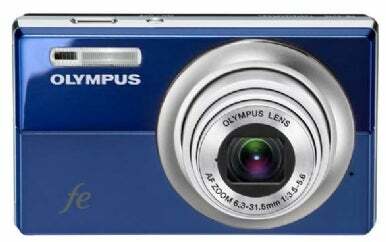 The Olympus FE-5010 is a basic compact camera featuring 12-megapixel resolution, 5x optical zoom, and a 2.7-inch LCD. For a camera that sells for under $200, you get a hefty 3,968-by-2,976 resolution coupled with a lens that can reach the 35mm equivalent of 180mm. That’s a fair amount of firepower. Taking pictures with the FE-5010 is straightforward. You choose from one of four basic modes: Program Auto, iAuto, Scene, or Movie. Then set the zoom and click the shutter. The FE-5010 takes it from there, employing technologies such as dual image stabilization and automatic shadow adjustment to provide crisp, well-exposed photos. Program Auto does a good job of setting aperture and exposure for you. In this mode you have a handful of options such as overriding the auto white balance setting and changing it to one of the six presets. You also have available four flash modes, exposure compensation, spot metering, two macro modes, and ISO adjustments up to 1,600. Having access to all of these tweaks makes Program Auto the most versatile mode, and a good choice for shooters with basic photography knowledge. If you select Scene mode, you have 14 presets to choose from including Portrait, Landscape, Sport, Indoor, Sunset, Fireworks, Cuisine, and more. Once you select a preset, the camera is in control and does a good job of getting the shot--provided you picked an appropriate preset for the situation. The FE-5010 has a 2.7-inch LCD. Then there’s iAuto mode, which I’m not a huge fan of because it doesn’t seem as smart as the person holding the camera. In this mode, the camera chooses from one of these scene modes: Portrait, Landscape, Night+Portrait, Sport, or Macro. There aren’t as many presets available as in regular Scene mode, and for me the results weren’t as good. For example, in a brightly lit gym, the FE-5010 in iAuto mode bumped the ISO up to 1,600 and turned on the flash. The images were terrible, in large part because the subjects were out of flash range. I set the camera back to Program mode with an ISO of 800 and the flash turned off and got much better results. When shooting at ISOs between 64 and 400, the FE-5010 produced clean, well-exposed images with a reasonable amount of detail. ISO 800 shows a fair amount of image noise and degradation of detail. And at ISO 1,600, overall quality begins to unravel. In our lab tests, the FE-5010’s posted a Color Quality score that barely made the top tier with other $200 point-and-shoot cameras we’ve seen. The camera scores for Exposure fell into the middle of the pack. The FE-5010’s Sharpness and Distortion scores, however, were below average. Since you have 12 megapixels of resolution, you can make prints up to 13 by 19 inches, which I did using an Epson Stylus Photo R2400 on Red River Arctic Polar Luster stock. The shots at ISO 100 were clean and colorful, even at this size, but optimum output was at 8.5 by 11 or smaller. I thought the detail was crisper at those sizes. Since this is primarily an entry-level camera, there isn’t much in the way of extended features. Olympus did include Perfect Fix, which allows the photographer to correct red eye or compensate for dim lighting while viewing the images in playback mode on the FE-5010. The corrections can be applied individually or in tandem. The retouched version of the picture is saved as a separate image, so you have both versions. Both corrections work well. While you’re reviewing your images in playback mode, you can crop a portion of a frame and the FE-5010 will save the cropped area as a separate shot. You can also resample pictures down to 640 by 480 or 320 by 240. These smaller duplicates are perfect for sharing on the Web or via e-mail. Smile Shot is one of the 14 Scene presets that’s built on top of the FE-5010’s face detection technology. But it goes an additional step. After a face is recognized, if the subject begins a smile, the camera fires off three shots to increase the odds of capturing the best smile. Image resolution is limited to 3 megapixels in this mode. It doesn’t always work, but the sequences that it does capture are fun. The Olympus FE-5010 takes good pictures and is easy to use. And if that’s all you’re looking for in a compact, then you’ll probably be satisfied with this camera. But for a camera that costs nearly $200, it feels as if there should be more features. Compare the options on the FE-5010 to the extra goodies on the Olympus Stylus 7000, for example, such as HDMI output, clever panorama mode, higher resolution 16:9 capture, beauty mode, more attractive body design, a larger LCD, illuminated controls, and a more powerful zoom. You don’t get any of those with the FE-5010, yet the price difference between the two models is less than $100. The FE-5010 is a good camera, but in the Olympus lineup of compacts, I consider the Stylus 7000 ( ) a better value.